A crackdown on luxury-goods smuggling by the Korean Air owner family has sufficiently spooked others to prompt them to declare their overseas purchases voluntarily. 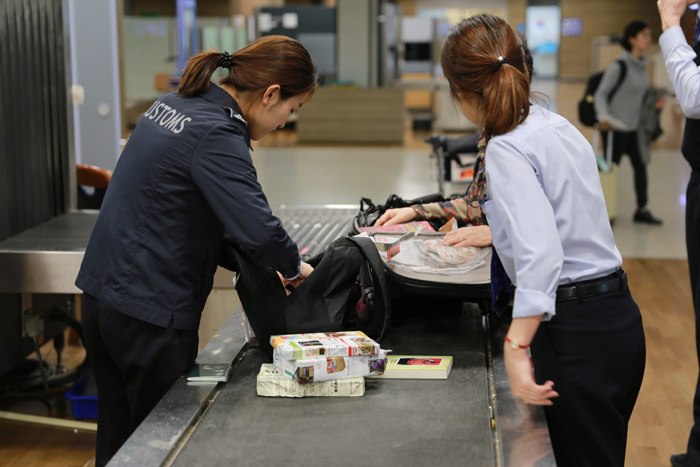 According to the Korea Customs Service on Wednesday, voluntary declarations of duty-free purchases by Korean tourists in the first seven months of this year rose 53 percent compared to the same period of last year to 114,825 cases. In 2015, when the government introduced voluntary declaration, 52,668 cases were reported. The rise is believed to have been prompted by a crackdown on the Korean Air owner family, whose homes were raided in high-profile operations to bring their hundreds of smuggled luxury accessories to light. Heiress Cho Hyun-ah faces trial but claims the purchases were all gifts. KCS official Seon Seung-kyu said, "As more and more Koreans travel abroad, public awareness of customs declarations has also spread, but the latest scandal involving Korean Air certainly helped a lot." People who voluntarily declare luxury purchases abroad can enjoy tax cuts. The limit on luxury purchases overseas for individual travelers is US$600, but people who voluntarily declare excess purchases can enjoy a 30-percent tax rebate, while those who are nabbed trying to smuggle them in face of a 40-percent surtax. Repeat offenders get slapped with a 60-percent surtax. In other words, a person who voluntarily announces the overseas purchase of a $1,000 luxury handbag pays only W61,000 in taxes. But the tax burden rises to W123,200 if they are caught smuggling. Customs officials have become more adept at nabbing smugglers whose sophisticated methods have been shared on the Internet. The availability of overseas credit-card receipts and use of x-ray scanners have made detection easier. "There used to be a belief that wrapping jewelry in aluminum foil could help evade detection, but new x-ray machines can spot it anyway," said KCS official Kwon Jong-won. "Also we can now search the Internet for the exact price of luxury products, so there's little use trying to get away with false declarations."